Saturday, 7 July 2018, 12:56p.m. Friends of a man who died in police custody after assaulting an 76-year-old on a central Auckland street say despite his violent actions he was a much loved mate and family member. Alo Ngata, 29, died in Auckland Hospital three days after a fracas with police as they tried to arrest him following an incident on Sunday afternoon in Freemans Bay. Police allege Ngata violently attacked a 76-year-old, kicking him five or six times in the head and rendering him unconscious. He then blocked police from getting to the injured pensioner and advanced on officers in a threatening manner. Police Tasered Ngata several times but he continued to resist them. It took four officers to restrain him. 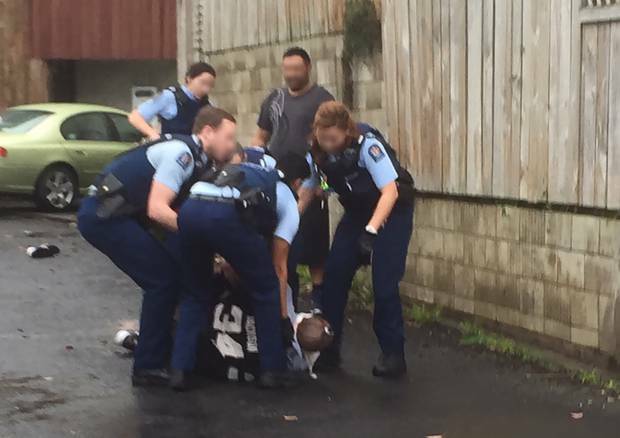 Ngata was transported to the Auckland Police Custody Unit in an agitated state. There he continued to resist police. Soon after, officers realised the 29-year-old was in "medical distress" and they started CPR and called an ambulance. Several investigations are under way to establish why Ngata died and what led to the violent attack and deadly aftermath. Ngata's friend Sugalu Moe contacted the Herald this week wanting to speak about him. Moe said it was a shame to see Ngata being portrayed as a violent offender. She hoped by speaking out people would realise that he was "someone's son, brother, relative and friend". "He was a loyal friend, amazing brother, dedicated son, loving nephew and the coolest cousin," Moe said. "His final actions when he was alive – we will never know how that came to be … What we do know though is the beautiful person we loved and treasured, we have now lost, way too soon. "He was a humble, generous, respectful, caring and bubbly addition to our family friends." Moe said Ngata "charmed" her and her family with his "heart of gold and easy going nature". "You could gift him with a $2 mug for his birthday and he would make it out to be the best mug in the world. "He appreciated any kind gesture, big or small, had a smile that would light up the room and was full of love. "For me personally … he always lifted my spirits when I was down, encouraged me when I'd struggle with my insecurities, protected me and always had my best interests at heart and would always make the dull moments fun ones." Moe was "devastated" by Ngata's death. "Our thoughts and prayers are with his parents, siblings and partner he sadly leaves behind," she said. "He will be sorely missed. I will miss him so much." Ngata's aunt, Kristina Sofele, told Newshub earlier this week that her family had no idea what drove him to attack the elderly man. "We're finding it hard to comprehend," she said. "The only thing we can think is that he must of been under the influence of some drug or alcohol." A witness - who told the Herald she had video footage of the incident - denied suggestions Ngata was on drugs, saying he was a dedicated factory worker and a "big soft teddy bear". She did not deny that Ngata attacked the elderly man but said the 29-year-old was mentally unwell. "I was saying there were demons in his head," she said. "He's sick. I was screaming, 'He's sick, he needs to go to hospital'." The woman claimed her friend was effectively "beaten to death". "They started smashing his head," she said of police. "His face was bleeding, his whole face was covered in blood. You could see blood dripping from his face." Police have rejected claims of brutality or excessive force in regards to Ngata's arrest. Auckland City Police District Commander Superintendent Karyn Malthus said she was "comfortable" with the way her staff handled the arrest. Malthus said police had been called to Ngata's address the day before the incident and were reviewing that visit as part of their investigation. Police had spoken with the deceased's family "to better understand what happened". "Any death is a tragedy and we are working with, and supporting Mr Ngata's family, including his parents and wider family who are grieving their loss," she said. The elderly victim is still recovering in hospital and is reported to be doing well.